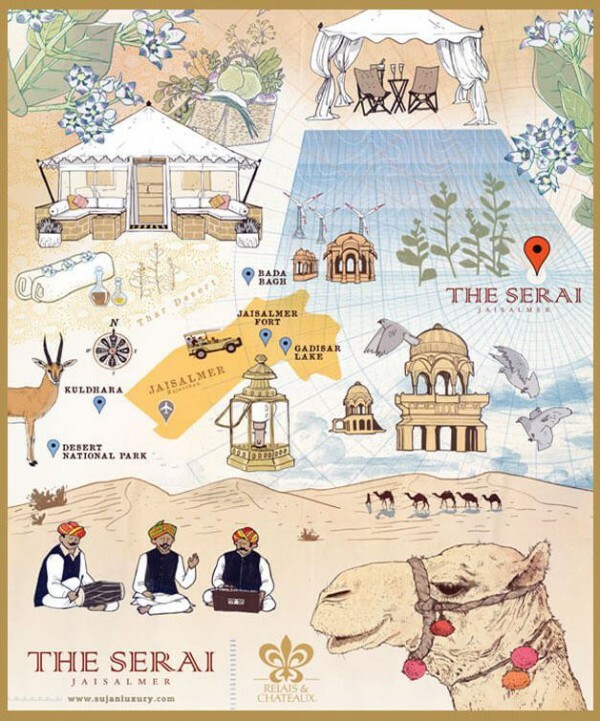 Redesigning your desert experience, The Serai by SUJÁN Luxury Camps & Palaces is a desert camp and spa that is spread over hundred acres of glistening sand. The star attraction of the hotel is its cozy tented suits that provide a distinguished experience sans any comparison. The tented suites have been built on sandstone and feature a spacious bedroom and an en suite bathroom. The luxury suite boasts of a private garden and a sunken pool while the royal suite comes with a personal spa, outdoor pool and dining and lounge tents defining luxury. A separate dining tent offers an array of traditional and multi-cuisine delicacies to tantalize your taste buds and provide a true dining experience. The guests can both select from our collection of wines and alcohols available at both, the restaurant and the bar area. Raison d’Etre, the pioneers in spa companies has shaped up the Serai Spa, four tents make up the spa that offers a number of treatments to rejuvenate and beautify you. Just the perfect place to help you unwind before your big day. The Serai makes for a welcoming wedding destination in Jaisalmer, if you want to plan your D day in luxury and extravagance. Further, the suites are personalized as per your need and specialized services pertaining to the requirement of your event is extended by the hotel. For more information on planning a luxurious desert wedding in Jaisalmer at The Serai, contact Memorable Indian Weddings today! ~ A bit lengthy form but would be worth of your effort to fill this up for free consultation and quote. It would help us better in ‘planning your destination wedding in India or South East Asia’.